Copying Process - Cheapest Fob Copying Service in Vancouver. 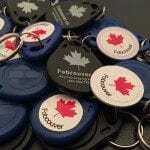 We copy 86 different types of key fobs. “Radio-frequency identification (RFID) uses electromagnetic fields to automatically identify and track tags attached to objects. The tags contain electronically stored information. Passive tags collect energy from a nearby RFID reader’s interrogating radio waves. Active tags have a local power source such as a battery and may operate at hundreds of meters from the RFID reader. Unlike a barcode, the tag need not be within the line of sight of the reader, so it may be embedded in the tracked object. RFID is one method for Automatic Identification and Data Capture (AIDC). RFID tags are used in many industries, for example, an RFID tag attached to an automobile during production can be used to track its progress through the assembly line; RFID-tagged pharmaceuticals can be tracked through warehouses; and implanting RFID microchips in livestock and pets allows positive identification of animals. After we have located the beginning and ending of the stream, we start to demodulate the data with known cipher keys. With six years of experience, Fobcouver has the cipher keys for every system in BC. Individual buildings do not have different ciphers; only different systems will have different ciphers. Knowing which cipher to use will only tell us what system you are using not what building it’s from. Our program will run your key through every known cipher with a 98.74% success rate. Finally when we have the key Information and the cipher used. We will place the data onto a donor fob and test it four times to ensure that the key will work before you pay us! With our programs we can create a copy faster than you read this page!